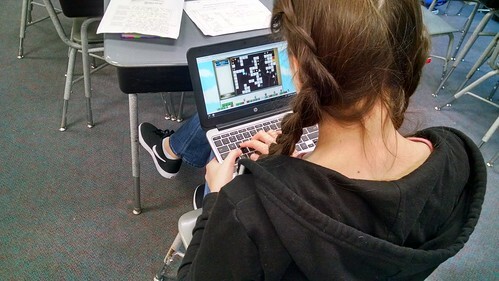 I can’t say I am utterly unknowledgeable about Minecraft, but my basic understanding comes from the excited chatter over the years of my sixth grade students, particularly during our video game design unit, and my youngest son. It’s often confusing chatter to an outsider like me, with a vocabulary and a flow all of its own. Whenever I have tried to jump into Minecraft, I have quickly gotten lost and felt aimless. I could always see the potential in collaborative World-building — and there are amazing examples of how educators are using Minecraft to connect with learning — but now I realized that what I needed were: goals with a interesting hook, a knowledgeable guide to keep me alive and a crew to hang out with. My Networked Narratives colleague, Keegan (ie Crazyirishman7, there in the corner of the video), provided all three, by setting up a Minecraft Realm server space and inviting NetNarr folks into an exploration of a new world. I joined in, along with Terry G. (“the Annihilator”), and we spent about 90 minutes watching the sun rise and set at an alarming rate, as we began to build a home before the zombies came, with a bed to regenerate ourselves; a garden for food that Terry farmed with gusto; and a mineshaft where Keegan and I began to seek out ore and then diamonds. Keegan, an educational technologist at the university level, clearly knew what he was doing. Terry and I clearly did not, as I scrambled to learn how to swim and walk and run and turn, and I kept a little command cheat sheet that he had sent us right at my fingertips. I’ve never been more grateful for fake torchlights and lanterns than I was yesterday. But that’s how expert-novice relationships work, and that’s how the Connected Learning theory comes into action with immersive experiences like this. We dove in, made mistakes, died a few times, re-spawned, and had a steady hand following Keegan, who was generous and patient with us. I know a whole heck of a lot about Minecraft now than I did 24 hours ago, even with lots of reading about it. I even ended up with a Diamond Pickaxe, after using the crafting device that Keegan set up. Apparently, that’s a good thing to have. Keegan also cut up the video into themed pieces at his blog, and that is probably the best way to get a sense of what we were talking about and doing. Since the Networked Narratives course is centered on a concept of Digital Alchemy, Keegan’s plan for the Minecraft World space is to move into “magic potions” and crafting of “elements,” as a way to explore the notions of Alchemy in a Worldbuilding Space. I find that intriguing, and watched as he wrote out our “goals” on the walls of the house we are building. He gave me a sign to play with, too. Our next step is to find a common time to go back to our world, and maybe invite a few more folks to come along with us (I’d say, connect with Keegan on Twitter and let him know). I’m intrigued by the possibilities of us building a world of magic, and then thinking about how storytelling might evolve from the mix and flow of immersive open-ended gaming experiences like this. 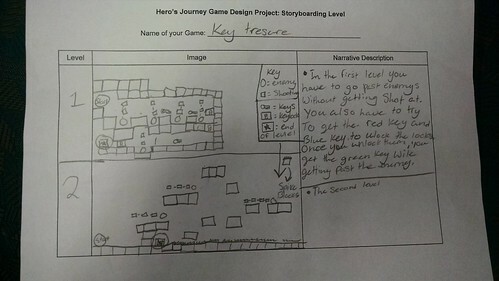 My sixth grade students are just now finishing up their Hero’s Journey video game projects in Gamestar Mechanic — they worked hard on design and story narrative and peer review and publishing — and many of the games have the elements that show solid learning. A few rise up as exemplar video games, in my opinion, so I want to showcase a few. 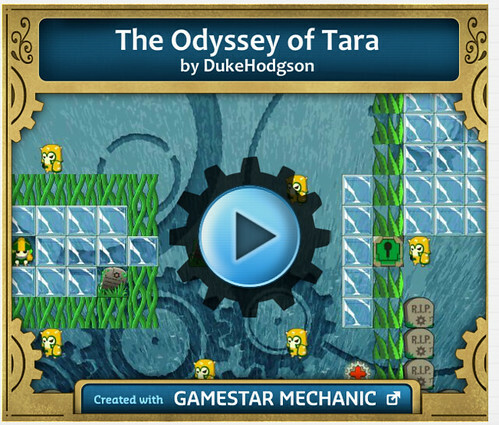 I used ThingLink to create a jumping off point (the links to lead to embedded games at our classroom weblog site) for you to play, if you care to try your hand at student-developed video game projects. As my sixth grade students were working on the final stages of their Hero’s Journey Video Game Design Project, I turned to my paraprofessional in the classroom, Sandy, to teach a lesson around advertisement. She had an entire career as an artist and magazine designer before moving into education, and her expertise about design and art is always worth tapping into. I am eternally grateful for her, on many more levels than this. She’s a real partner in the classroom, every single day. Sandy taught them about the visual — of the icon being large and representative of the game concept — of lettering and color, of catch-phrases, and so much more. We looked and broke down some traditional video game advertisements, too, talking about technique and loaded words and phrases. The results of the advertisements were pretty cool, and the ads are now being hung in my classroom. But I grabbed a few and made a video with them, too, as a way to celebrate my sixth graders as artists and designers. 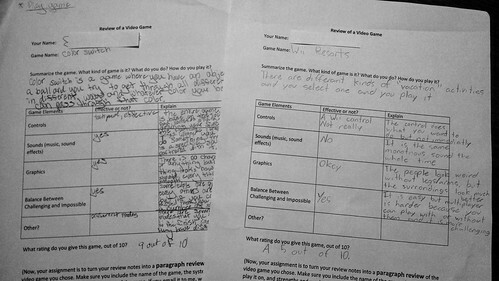 Many of my students are finishing up their video game reviews, an activity in persuasive writing in which they used a design focus to explore the pros and cons of a chosen video game. They don’t mind this writing at all. 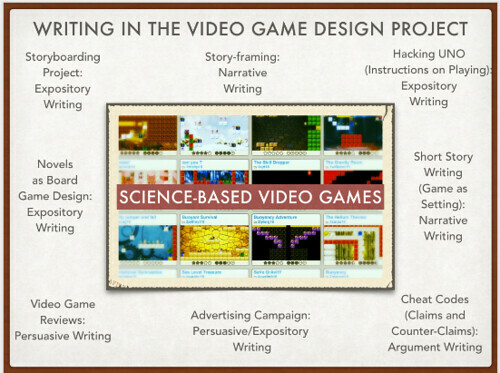 In fact, my students who struggle the most with writing but who enjoy gaming find intense focus on this assignment, as they are tapping into their own knowledge and expertise and interest. We do this reviewing with a focus on design: playability, graphics, music, controls, etc. 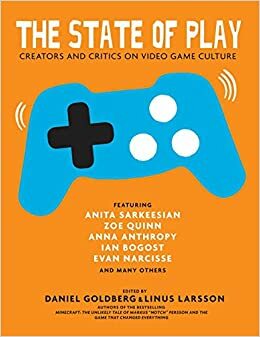 Along with looking at the writing, and noting to them that this kind of persuasive writing will soon shift into argumentative writing, I am always curious about which games are most popular in a given year. Last year and the year before, Minecraft had everyone beat. Not this year, so much. This year, I am finding a lot of kids reviewing, and playing, ROBLOX, which I had not heard much about until my own son came home from his Minecraft Club saying everyone had moved over to ROBLOX for the afternoon. Apparently, in ROBLOX (which I have yet to explore), you play games that others in the community build, and you build games that other people play (sort of like our work with Gamestar Mechanic, which is designed more to teach basic game design principles and is a closed system). 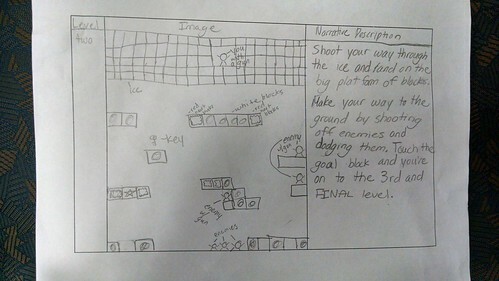 We’re in the early days of our Video Game Design Project, in which my sixth graders are learning how to use a narrative “story frame” to design and publish a video game via Gamestar Mechanic. As a writing teacher, my aim is to show how story can become the backbone of a video game, and how the reader “plays” the story that the game designer has written. It’s all about expanding the notions of Digital Writing, and how games are emerging as the place for inventive storytelling. This week, students have been brainstorming their “story frames” and that work is done before they can start designing their games. I want them to have a “map” of where they are going before they starting designing with blocks and avatars and rewards and more. I am always pleasantly surprise by the detail of their brainstorming and their imagination. 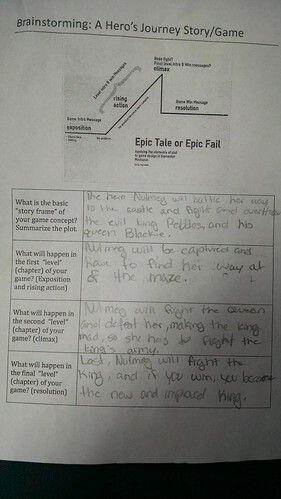 Our theme this year is “the Hero’s Journey/Quest” — a topic we have been building off since September (in the past, these games were all science-themed, but this year’s shift to Next Gen Standards for our science teacher created a bit of a problem for us, so we’ll try again next year). 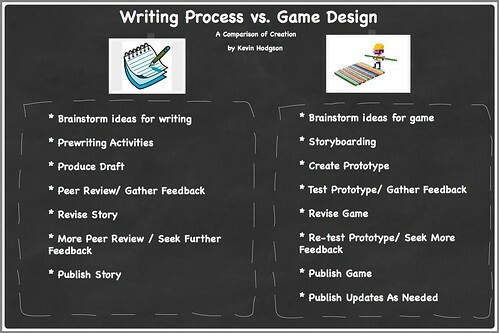 We connect game design to writing process and we do a lot of writing in this unit, from Game Developer Reflections to writing persuasive Game Reviews (as podcasts) to using their “game worlds” as setting for short stories, and more. 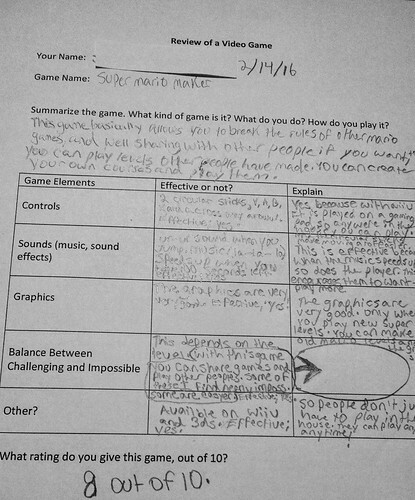 I aim to use their engagement in game design to spark their interest in writing across genres. 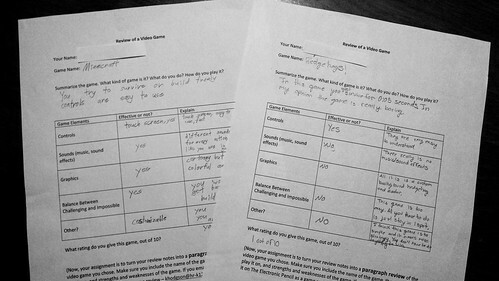 As a mentor text, I dissect my own game for them. My game – called The Odyssey of Tara — is a riff off The Odyssey, where our hero — Tara — has to make her way home, fighting monsters and battling obstacles along the way. I’m looking forward to playing my students’ stories. The most innovative idea that I came across this summer? How about John Hunter’s World Peace Game concept? The game is incredible and complicated and pushes all sorts of learning in all sorts of directions. 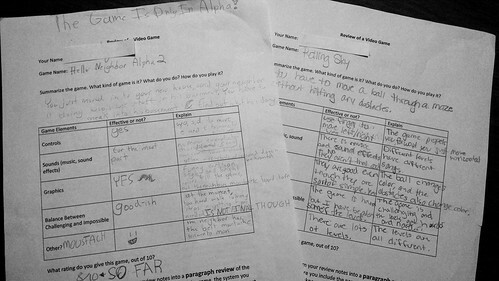 Hunter’s story of how he developed this intensive game that upped the ante for his fourth graders (and other assorted age groups as he brings the game elsewhere … including the Pentagon, where military leaders played it, too) as he asks players to help solve problems facing the world. His story is certainly worth a look, if only for discovering another way to re-examine our classroom spaces as something beyond testing and mandates. 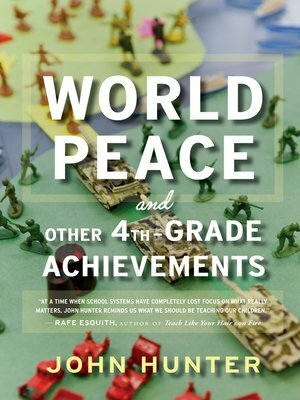 Read my review at Middleweb of World Peace and Other Fourth Grade Achievements by John Hunter. The other day, I found myself with a few dull minutes to spare while waiting for my son. What did I do to kill the time? Tetris on my Android phone. It’s amazing that this simple game still holds appeal in this modern age, but it does. 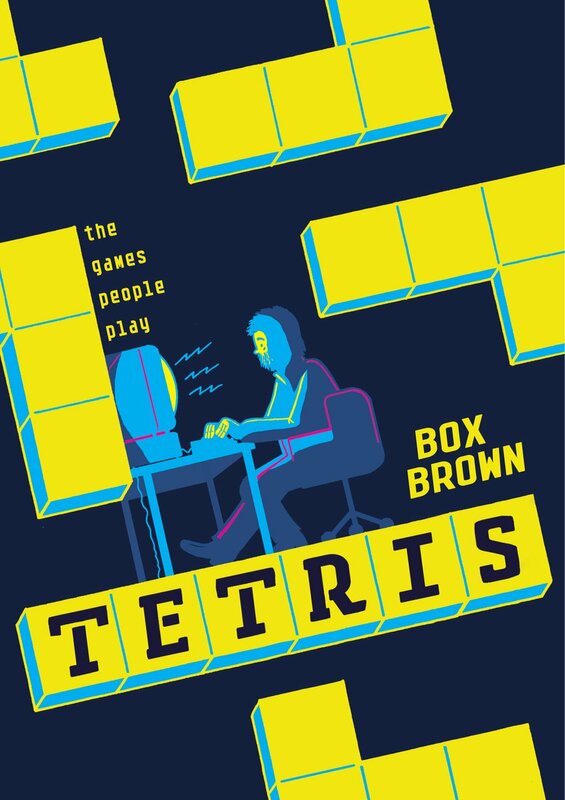 A new graphic novel Tetris: The Games People Play by Box Brown not only explains the appeal of the puzzle challenge on the brain and psyche, but also explores the fascinating history of the game itself – from origin to launch to pop culture icon. 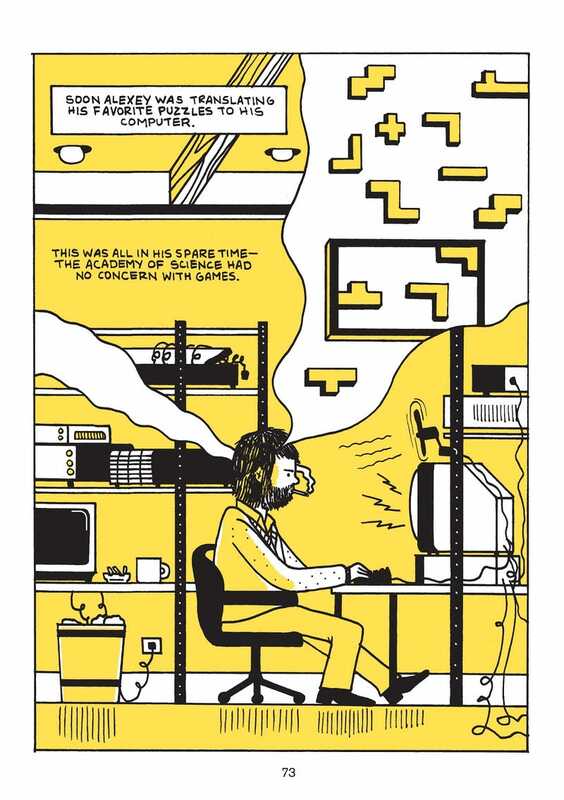 The appeal of Tetris has to with the psychology of games, and Tetris hits it on all cylinders. There’s the frontal cortex, trying to flip and slide the shapes while they drop. There’s the rush of finishing a line. There’s the quickening pace of action. The player hits a “flow.” It’s all part of the psychology of game design. Then there’s the rich history of the game itself. Developed by Russian computer scientist Alexey Pajitnov as a side project during the Cold War, in the early days of PCs and video game programming, his Tetris concept of interlocking blocks first took root in the old USSR. Then the game was smuggled out of Russia on floppy discs, and then the game became the object of a global bidding war between companies in Japan, Europe and the United States, even as the political structure of the USSR made negotiations nearly impossible. You may remember Tetris as the anchor game on many early gaming systems — including Game Boy — but how it got there is an amazing tale of politics and copyright and deceit, and lots and lots of money. Box Brown weaves the tale wonderfully in this graphic novel, which could find a home in a high school classroom where gamers and historians collide. PS — I received an early copy from First Second Publishing to review. The book is out in October. NOTE: I am writing this to try to understand this …. 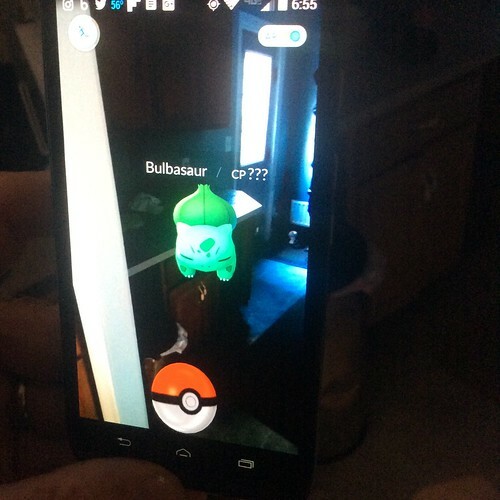 Like many of you, I have been intrigued and bewildered by the sudden explosion of Augmented Reality with the release and wild popularity of the Pokemon Go app game. 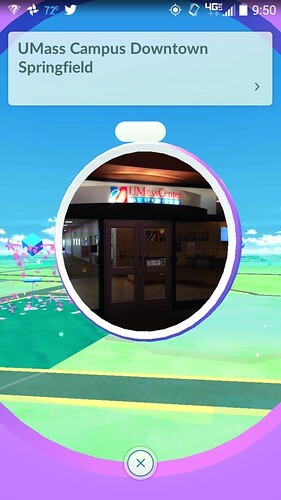 For me, my awareness of the game began when Joe Dillon (noted CLMOOC Pokemon Scholar) wrote a fascinating blog post in which he tried to examine the use of Pokemon Go through the lens of Connected Learning. I’ll echo what I saw in a headline from Rolling Stone magazine later that same day: WTF is Pokemon Go? Within hours of reading Joe’s post, I was bombarded in my news feeds about the game. I dropped my youngest son off at his camp, and his teenage counselors were playing it. I helped with summer baseball that night, and groups of kids were playing it. 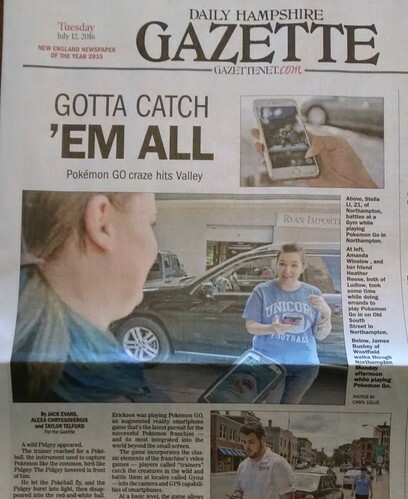 The game was featured in a front page story in our local newspaper (written by college intern journalists .. it takes young people to notice a pop culture phenomenon at times). It was everywhere. So, I downloaded the game, to check it out. I am pretty darn confident that most of my upcoming sixth grade students are either playing it or know about it this summer. It doesn’t make sense to ignore a cultural moment. I wanted to know more. You probably know as much as I do about the playing of the game itself (if not, and are interested, just Google Search it.) For starters, I found a Pokemon floating around in my kitchen. I tossed the red balls and captured it. I tried the game again when I was in a nearby city, visiting some writing project teachers, but felt strange in the parking garage, staring at my screen and walking in circles. In the meeting, a bunch of teachers were talking and joking about … Pokemon Go. The next day, the negative sides of the app began filtering out, with news reports about robberies and accidents, and all the usual stuff that sparks the adult anxiety that new technology always leaves in its wake when young people (and in this case, older ones, too) are consumed with something new. None of that changed my impression that, as a father of three boys who were somewhat into Pokemon when they were younger, the game probably was connecting people in an interesting way with technology and game play. What concerned me more than all of that (as it should you) was the privacy issues, and the collecting of reams of data by the company from its users, and the way the game seemed to want access to my entire Google account. (I believe the app update fixed that with an update, but I had uninstalled it). Here’s what interests me more about this particular moment than Pokemon Go itself — which may or may not turn out to be little more than a technology fad in the summer of 2016. What if this sudden interest in Pokemon Go spurs young people to suddenly realize how the layering of visuals and information on the physical world could be another way into digital composition, and they begin to find ways to do this on their own? I shudder to think of a class with iPads doing Pokemon Go as a learning experience (that might be hard to justify on all sorts of levels), but I could celebrate a class with iPads making their own Augmented Reality apps or stories or scavenger hunts. Some apps, such as Aurasma and others, do this on a smaller scale. The use of QR codes replicates the experience, somewhat. I don’t pretend to know the technical aspects to pull off what I am thinking. Combining GPS with media, accessible via mobile devices, in different places … sounds complicated to me. But intriguing, nonetheless. It’s that flip from media consumer to media creator that we should all be looking for. Imagine the possibilities … or it just might be another technology pipe-dream that always seems like there is something transformative coming (see Audrey Watters for her extended examinations of the Ed Tech World always promising revolutions in learning). Or, alas, it might just get co-opted by private ventures who make money off our data by tracking our GPS coordinates to target us with AR advertisements.